Contains all the features needed for full pole line analysis in one integrated software tool, providing the best overall value. Quick Pole supports requirements that go beyond the minimum values in the national standards. 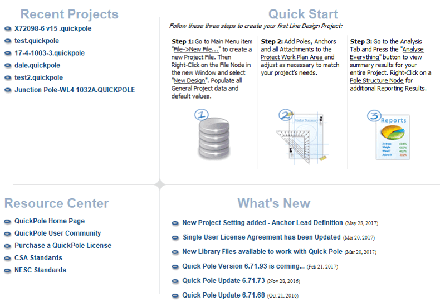 Supports corporate, private and/or custom standards via Quick Pole's flexible dataset management tools. Contains a stand-alone tool for sags and tensions, vital to creating your own corporate standards. At Sonideft we understand the importance of pole lines to your business. The investments you make, the need to maximize their value prior to retirement and the need to address safety and code compliance. We understand that failure to carefully consider all the implications to these assets can hurt your business financially, create liable situations and increase unwanted scrutiny from your regulator. Quick Pole provides several electronic data import methods available for your field data, saving time spent on data re-entry. Supports many typical pole owner requirements. All necessary features are integrated into a single software package, reducing time spent learning and entering data and trying to interpret and consolidate results. Quick Pole’s final result is guaranteed to reflect the results of all its features, without error. Evaluation and reporting processes are highly automated, satisfying many of the reporting needs of attachment permits. Just select what you want and Quick Pole will guarantee it will be included in the output package for all poles and spans in the project. Often it can happen that the pole lines you intended to attach to can prove to be costly once the Quick Pole runs its analysis. When this happens you want to evaluate different options that can achieve the same end goal on a small number of poles within your project. Without this ability you could find yourself paying too much in both money and time because of business pressures – the need to Get It Done. Quick Pole allows you to copy the entire original intended design into a separate, editable copy where you can make changes. You can then apply different approaches to which poles you attach, where you attach or the amount you plan to attach. This process can be duplicated many times, each covering a different scenario. You can then select the scenario that suits your business needs best. Avoid three poles that are overloaded today and would be costly to replace. Route cables to avoid these poles. Instead of placing feeder and distribution cables on a five pole section, place the feeder/larger cables on another pole line route and just attach a small distribution cable in this section. Instead of placing a new messenger/strand to support a new communication cable, over-lash onto another existing messenger. Quick Pole contains several features in one integrated package. While other solutions usually require the use of other software tools and assemble/interpret the results yourself, Quick Pole’s final result is guaranteed to reflect the results of all its "Best in Class" features, without error. No aspect of the Pole Line Analysis requested can be mistakenly left out from any pole or span within the project. Quick Pole was designed from the ground up, specifically to address the needs of distribution and joint use pole lines. Functionality has been optimized and limited to only these needs; which makes it simple and easy to use. Extensive reporting to meet the needs of most pole owners. Experience has shown that most users require very little training to start using Quick Pole. Sonideft has tested Quick Pole in many different scenarios and is not shy about publishing all of these tests and comparison results on its website. Quick Pole provides additional reports so that anyone can better understand the various steps, calculations and algorithms used. Quick Pole supports the standards of the pole owner and several other third parties simultaneously. Quick Pole enforces code compliance as minimum requirements with no user ability to circumvent. Tension adjustment factors to lower the assumed tension values in attachments are not available in Quick Pole. Quick Pole has a wide array of tension settings available to support real evidence that can be found in the field or in utility standards. Quick Pole results are completely defendable based on solid engineering principles. Quick Pole enforces pole owner requirements that exceed the minimum requirements stipulated in the national standards. The most common example is higher clearance values over roadways and other areas. We have an exceptional track record of listening to customers' requirements and doing what we can to make their work easier, more complete and easy to present. Sonideft releases many small incremental software updates each year so requested features can be implemented as quickly as possible. Whatever your specific requirements are for training, Sonideft is equipped to support you. We offer remote training, on-site training or training at our location. We can offer suggestions related to specific projects. Training and support on your schedule to help meet your timelines and cost targets. Quick Pole offers a cost effective and complete integrated solution in the areas of structural analysis (including soil), sags and tensions, clearances, separations and reporting requirements. No pole line analysis is complete without considering more than one aspect. Quick Pole offers a solution that addresses all of them. Wide range of reporting capabilities. Quick Pole summarizes the results for the average user and also provides detailed insights into key pole line behaviours for experts. The founder and principle engineer has over 35 years of experience helping both pole owners and third parties meet their due diligence, reporting and business needs related to pole lines. He has a solid foundation in the engineering principles involved in the analyses required and has been significantly involved in the development of several National Code Standards for over a decade. Having been exposed to several pole line analysis software tools over his career and noticing shortcomings, he made it his mission to develop a high quality, professional, multi-featured, easy to use product at an affordable price for everyone. As a professional engineer himself, the founder recognizes the due diligence requirements of engineers and the need to easily understand what the software is doing, while providing quality and reliable results. Sonideft strives for excellence and stays on top of the constantly evolving industry requirements. Quick Pole can generate a customized Data Collection Form for use with the IKE4 Field Data Collection Device. Form options include data from the Utilities who own and are attached to the structures, plus any custom datasets you choose. Quick Pole can import IKE4 data using this form into a new or existing project with ease. Enables automated clearance calculations and tests when imported into Quick Pole. Optimizes the collection of data in the field so that return trips are rarely, if ever, required. Increases productivity of inside workers as importing this data into Quick Pole is automated. Quick Pole has been tested to meet CSA, NESC and GO 95 standards. Clearance values across all categories can be enforced to meet a pole owner standard higher than required by code. The lowest air temperature and average snow depth can be set to pole owner requirements. Quick Pole comes pre-loaded with example data to get you up and running quickly. Wires. Quick Pole has a database of over 1500 wires commonly used in North America, plus you have the ability to import/create additional wires from manufacturer supplied “.wir files”, or other data at any time. Amongst the physical data that Quick Pole retains on wires are the nonlinear stress/strain and creep curves for both the outer and optional core materials. The materials used are not restricted to metals such as steel, aluminum or copper (they can also be Kevlar yarns or fibreglass rods). The nonlinear stress/strain and creep curves are defined as fourth-order polynomials for maximum accuracy. The ability of the soil around the pole to withstand both vertical compressive loads and groundline bending moments. The ability of a specific anchor to hold tension loads. Both tests are based on the class of the soil. Quick Pole can predict the exact position of any location along the span for any wire, under any load condition. Regardless of elevation changes or special tension settings, Quick Pole can easily predict the wire’s path and the point where the sag of the wire is greatest. Mid-Span separations of wires under different conditions (typical code requirements) can also be tested easily, including power wires that sag below the line of sight of communication attachments. Assuming constant ground slope between any two poles, Quick Pole can predict the clearance to ground for any wire and compare it to any applicable code requirements you selected. Quick Pole allows you to define as many specific points along the span to be tested against different code requirements, each point having their own elevation. For example: If you had a roadway in the span, you could mark both edges of the road plus the center (elevation, distance in span) and test them for road clearance requirements. The remainder of the span could be tested against pedestrian values. A graphical span profile is provided to instantly see the results. All span attachments have their sag and tension results scanned for the worst conditions that a structure would be expected to support, broken out by constant components and a variable component like wind. All hardware items are evaluated under the worst weather load conditions for the loads they would place onto a supporting structure (forces, bending moments, wind load). Linear. In this method all structural components are modeled in a holistic Finite Element Model, the loads are applied and the resulting stresses/deflections are computed. The variable wind component of the loads are applied in incremental direction/angle increments until a full 360 degrees around the structure has been evaluated. The final result reported is the one that results in the highest loads/stresses for the structure. Vertical buckling load capacity is evaluated against Gere-Carter methodologies, an enhanced Euler method to account for pole taper. Geometric Nonlinearity. Accounts for P-Delta effects and is mandatory for CSA code compliance. Basically this means that the Finite Element Model for the whole structure must be updated during the analysis iterations to account for the movement/deflection of the structure and supporting members such as guy wires. Attachment Load Nonlinearity. This accounts for the reality that the tension in the span attachments (wires) can change as the structure they are attached to moves/deflects. This is recommended in the CSA codes, but not mandatory at this time. An example of this would be a pole with a short and long span with one wire attached near the top. During storm load conditions, the long span will create more tension than the short span, which will make the pole move a little towards the longer span. This action will slacken the long span a little and tighten the short span. The resulting load on the pole to handle is less than the initial differences in tension as they become much closer in reality. Can easily address sidewalk strut fixtures as part of the analysis. Will specify exact requirements for pole mounting on top of rock, or the size/class of pole to be used as a push /pole brace, if used. The pole structures before and after the loads are applied, highlighting the stressed and overloaded areas easily. The span of attachments between any two pole structures showing maximum sag and line of sight considerations. The work plan showing an aerial view of all poles in the project. Poles with analysis errors will be highlighted in red for easy locating. Quick Pole provides summary textual results that highlight the key items for designers. Span attachments immediately provide feedback upon additions, deletions or changes. Pole structures provide feedback during analysis of the whole project. Any structure report can be generated manually at a particular pole. All structure reports plus six project-wide reports are available to be generated as one logical report as a batch process. All reports can be exported into a variety of formats, including PDF. Quick Pole supports the import of data from your field data collection processes. This is an area that is high priority for Sonideft as more and more customers are beginning to collect their field data electronically. KML/KMZ files. Standard Google Earth format. 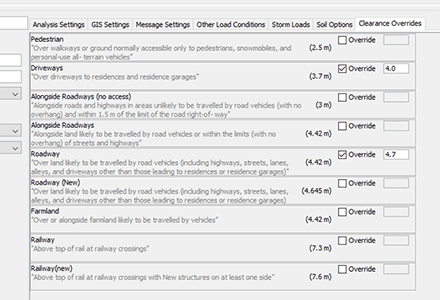 We have seen a few variations of these formats to-date and are able to import pole, anchor and building locations plus a set of other attributes which can be seen in the appropriate editors. The KML format is well defined for coordinate locations and allows other data to be included in the file at the same time. Typical examples would be to include pole class, height and species as extra data. CSV files. Similar to KML files, pole anchor and building data can be imported. There are plans to address other data possible in this format (such as the additions of guy wires to anchors and wire attachment heights). JSON files. Complete with its own IKE4 form generator, Quick Pole has been highly optimized to collect and import IKE4 data with ease. You can start a project and evaluate any number of poles without capturing any GPS locations at all. Quick Pole supports several methods of entering field data based on traditional field data collection methodology. Drag and drop poles onto a work plan area and move them to the desired locations manually, checking span lengths and angles presented to the user. 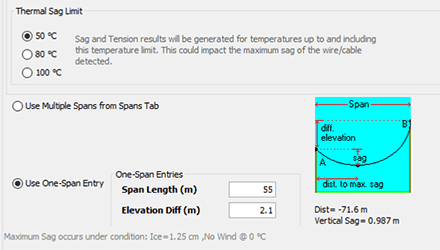 Place a couple of poles on a work plan manually to start a project and then use Quick Pole’s 'Pole Sequence Loader' functionality to load the rest of a pole line by specifying span length, pole line deflection angle and optionally any elevation changes. Laterals off this initial line can be added using this same feature and starting at the take-off pole. You can open the table in the coordinates editor window and manually enter coordinates for poles in X,Y perspective. You can also create a coordinates list in Excel and paste into this table. Google Street View is currently available once the datum/zone is defined for the project and at least one pole is known for its approximate GPS coordinates. If some of the data import features are not ideal for you, you can also paste content (with GPS coordinates) into the coordinates editor window. Additional GIS features are currently in development.